'Suspended in deepest blue with sunrays slicing down from the surface to the depths I feel him sing. Floating fifteen meters above him we don’t matter in the least, we hardly move – our eyes and hearts fixed on the outline of white whale-tail glinting below, enveloped in a cloud of sound foreign to any terrestrial being, it is not only a listening experience - in water sound comes from all directions at once and if loud enough penetrates your skin, muscle and bone until you are vibrating in the throes of something much greater than simple listening. The singing humpback male hangs suspended in blue water below us while we hang suspended in his song. 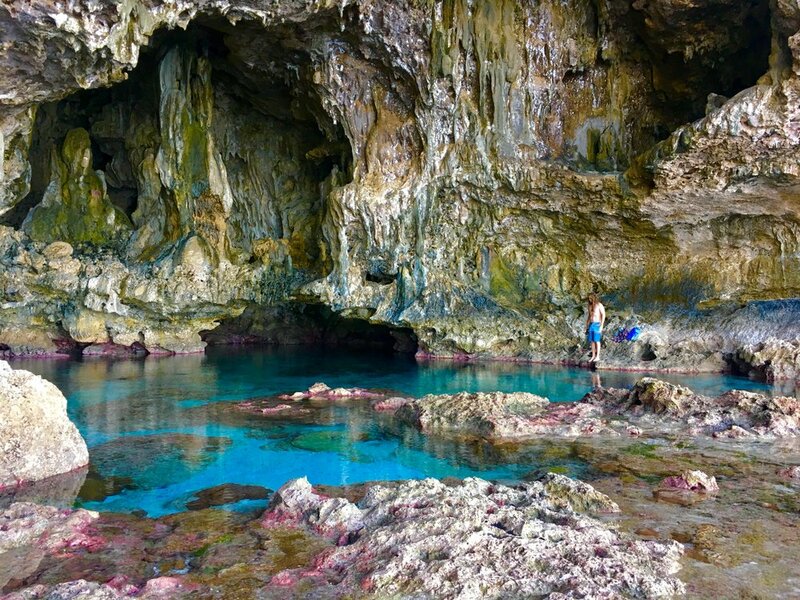 We have just returned from our first ever trip to Niue island in the South Pacific and to say our team and guests were blown away would be an understatement! We all expected the water to be blue and to see some whales (that's why we'd travel over 36 hrs to get to this remote little island, right!?) but we did not expect the absolute expansive clarity of that blue water, the variety of life, structure and reef. We didn't expect the island itself to be the most exquisite mix of Jurassic Park-like jungles and Avataresque secret clearings, pools and chasms. Yes, when you start comparing a place to pure fiction and even science fiction you know it surpassed all expectations! We alternated deep ocean days with island and reef exploration, rope training done drifting in the blue with over 300 meters depth beneath us and calm surface conditions with low tide scrambles to secret caves where stalactites hang suspended over mirror-calm pools populated by electric blue fish and beautiful corals. Yoga sessions with a 180 degree view and playful spinner dolphins, fresh coconuts and flitting butterflies. We've only just come back from this trip but we're already planning our migration back next year to once again meet the singing giants. A small video of our time in Niue - thank you to Steph, Seth, Antonia & Yaniv for making this such a magical trip!